Snake Bait is paranoid, cold-blooded and hard of hearing. He'd prefer to be home with the heat on "high" and the TV volume "up." A spitter, Snake Bait tends to "say it" and "spray it" when he speaks. 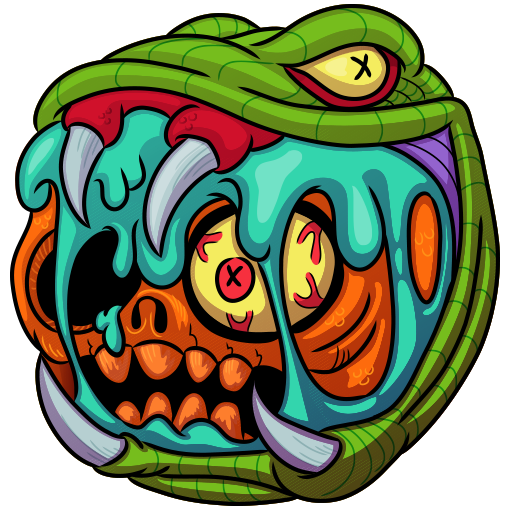 Okay, so last time, we said that some Madballs get reimagined and redesigned - and here's the proof! 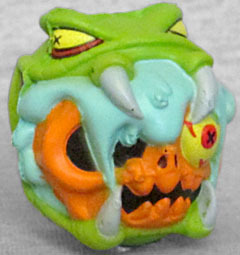 You may remember Snake Bait from the cancelled third series of Art Asylum Madballs - there, her design was pretty much a direct update of the '80s ball, being a Gorgon with snakes wrapped all around the head and leaving the face exposed. Fair enough. 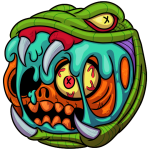 Well, the new Snake Bait is an orange skull with a single eye, being swallowed by a venom-dripping serpent. That's not the same thing at all! Still, there's no denying that this is a kickin' design! Orange and green make a strong contrast, and the saliva or venom or whatever is in the snake's mouth is a paler shade than its skin. Even the silly X-shaped pupils work better here than on the other figures, because the person is, for once, actually dead! The snake gets them, too, but that just makes him look more ophidian. The back of the head has a strange series of bumps in an X pattern, as well - not sure what that's meant to be. This entry was posted in blog exclusive review and tagged Madballs. Bookmark the permalink.